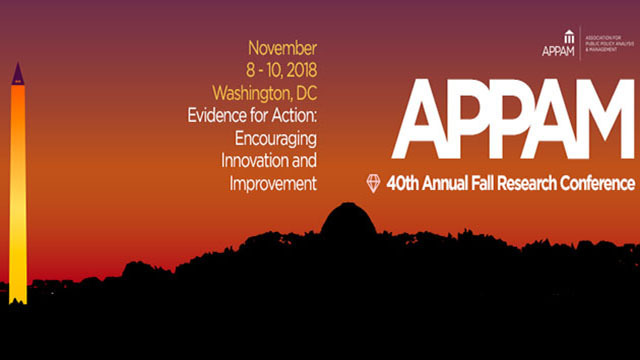 From November 8 to 10, the Association for Public Policy Analysis and Management (APPAM) will host its 40th Annual Fall Research Conference in Washington, DC. A proud partner of APPAM, Mathematica is reimagining the way the world gathers and uses data. Highlighting progress made within the field, Mathematica experts will participate in more than three dozen presentations, covering a variety of important and emerging policy topics. On Thursday, November 8, Mathematica President and CEO Paul Decker will join other industry leaders for a roundtable discussion on the extent to which the field is applying insights from the modern data revolution to social science as well as key questions and challenges that have spanned generations. This super session, “40 Years of Evidence for Action at APPAM and in the Field,” occurs on Thursday afternoon at 1:45 p.m. in the Lincoln 4 conference room. Innovation Lounge. Mathematica is the proud sponsor of APPAM’s inaugural Innovation Lounge. These 45-minute sessions will highlight cutting-edge work in data science and social science in the Exhibit Hall. Equity and Inclusion Fellowship Luncheon. Help us honor the accomplishments of the 2018 APPAM Equity & Inclusion fellows on November 9 at noon in Thurgood Marshall West – Mezz level. Get that Passport Stamped. Visit the Mathematica booth (207–209) to share your favorite APPAM moment, snap a selfie with President-Elect Matt Stagner, and help build a data visualization in real time. And don’t forget your special stamp for APPAM’s grand prize giveaway. Chat with Matt. Mathematica Vice President and APPAM President-Elect Matt Stagner will be on hand to speak with conference attendees about evidence-based policy, trends and opportunities in policy research, and APPAM. Stop by the Mathematica booth (207–209) snap a selfie and chat with Matt! Click here to view a full list of Mathematica’s presentations. Share your thoughts about APPAM using the conference hashtag #2018APPAM and be sure to follow us on Twitter, Instagram, and Facebook.